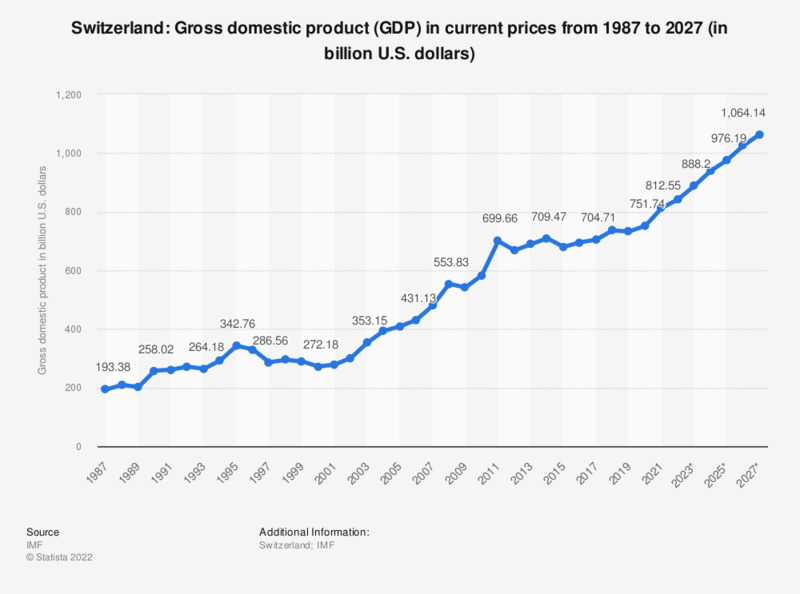 The statistic shows the gross domestic product (GDP) in Switzerland from 2012 to 2017, with projections up until 2022. GDP refers to the total market value of all goods and services that are produced within a country per year. It is an important indicator of the economic strength of a country. In 2017, GDP in Switzerland amounted to around 678.97 billion US dollars. Switzerland’s gross domestic product has hardly been affected by the global economic crisis of 2008, if anything, figures have been increasing steadily. After a brief stint in the negative range in 2009, gross domestic product / GDP growth in Switzerland has been positive every year, with 2010 marking the most successful year since the crisis. Switzerland’s share in global GDP (adjusted for Purchasing Power Parity) however, has been declining continually for the past decade. All in all, Switzerland is a fairly wealthy country with a stable economy. This is reflected in its employment figures and national debt, as well as the abovementioned fact that Switzerland remained largely unaffected by the economic crisis. Additionally, Switzerland was first on a ranking of countries with the highest wealth per adult, with an average national wealth of more than 540 million US dollars per Swiss adult. Subsequently, Switzerland is also one of the leading countries with the highest rate of millionaires, which is probably due to Switzerland’s unequaled low tax rates. Switzerland’s economy is said to be highly competitive, its most important sector is manufacturing, with numerous large corporations being headquartered in the country. Main exports include chemicals, as well as precision watches and instruments. Statistics on "Economic Outlook Switzerland"